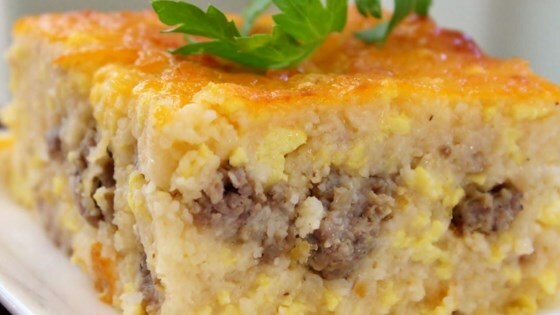 "If you're from the South you will definitely love this recipe, which includes grits, eggs, sausage, and cheese. When I cook it, I place it in the slow cooker to stay warm. There is nothing worse than cold grits." Bring water to a boil in a large saucepan, and stir in grits. Reduce heat, cover, and simmer about 5 minutes, until liquid has been absorbed. Mix in 1/2 the butter and 2 cups cheese until melted. In a skillet over medium-high heat, cook the sausage until evenly browned. Drain, and mix into the grits. Beat together the eggs and milk in a bowl, and pour into the skillet. Lightly scramble, then mix into the grits. Pour the grits mixture into the prepared baking dish. Dot with remaining butter, and top with remaining cheese. Season with salt and pepper. Bake 30 minutes in the preheated oven, until lightly browned. A crowd-pleasing casserole with bacon, bell peppers, and a cheesy crouton base. This was very good. I threw it all in the crockpot once combined and it turned out great. Made it again 2 weeks later and added crumbled bacon. I think that was better than the sausage.